Why Were These U.S. Attorneys Fired? Former U.S. District Attorneys Carol Lam, David Iglesias, John McKay, Daniel Bogden and H.E. 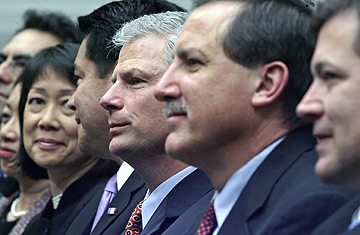 "Bud" Cummins, left to right, listen to testimony during a hearing of the House Judiciary Committee on Capitol Hill in Washington, D.C., March, 6, 2007. After Republicans lost control of Congress last year, newly empowered Democrats promised to launch a series of tough investigations on everything from the Iraq war to Medicare and high energy prices. But since taking charge on Capitol Hill in January, a series of unexpected new issues have captured their attention, none potentially more damaging to the Bush Administration than the controversy over alleged political influence in the firing of eight Republican U.S. attorneys last Dec. 7, in an episode that some of its victims have already taken to calling the "Pearl Harbor Day Massacre." The White House approves all U.S. attorneys, who function as the federal government's chief prosecutors in 93 jurisdictions around the country. As political appointees, they serve "at the pleasure of the President," and can be replaced, at least theoretically, at any time for any reason. But group firings in the middle a presidential term are highly unusual. Though Attorney General Alberto Gonzales insisted to Congress that "I would never, ever make a change in a U.S. attorney position for political reasons," critics were outraged at the December dismissals, among them the firing of an Arkansas U.S. attorney to make way for Timothy Griffin, a prot�g� of White House political guru Karl Rove. The outcry forced Griffin to withdraw. Gonzales' top deputy later claimed the firings were necessary because of "performance-related" issues. But it was later revealed that all but two of the dismissed prosecutors had won outstanding evaluations for competence. Those revelations set the stage for Tuesday's dramatic appearance of six of the ousted Republican prosecutors before House and Senate committees dominated by Democrats. One of the fired prosecutors, David Iglesias of New Mexico, testified that he felt "leaned on" by Sen. Pete Domenici over a case he was pursuing. Iglesias said the New Mexico Republican and former mentor hung up on him after learning Iglesias would not seek indictments in a criminal investigation of Democrats before the 2006 election. "He said, 'Are these going to be filed before November?'" Iglesias recalled. "I said I didn't think so... to which he replied, 'I'm very sorry to hear that.' And then the line went dead. "I had a sick feeling in the pit of my stomach," Iglesias testified. "Six weeks later I got the call that I had to move on." The ousted prosecutor also said that Heather Wilson, a Republican House member from New Mexico, had called him about the same issue. Both Domenici and Wilson confirmed that they had gotten in touch with Iglesias, but denied pressuring him in any way. The Justice Department also acknowledged that Domenici had called Attorney General Alberto Gonzales and his top deputy four times to complain about Iglesias' behavior, inquiring whether he was "up to the job." Another fired U.S. attorney, H. E. "Bud" Cummins of Arkansas, testified that he had e-mailed fellow ousted prosecutors last month, warning them of a threatening message conveyed by a senior Justice Department official. Cummins' e-mail, which was released publicly, quoted the Justice official as warning that if fired U.S. attorneys continued to talk to the media or volunteered to testify before Congress, the department "would feel forced to somehow pull their gloves off" and fight back. The DOJ denied the allegation. Yet another sacked U.S. attorney, John McKay of Seattle, declared that a top aide to Rep. Doc Hastings, the former Republican chairman of the House Ethics Committee, had called him to ask detailed questions about a politically charged investigation McKay was conducting into the disputed 2004 election of Washington state's Democratic Gov. Christine Gregoire. Hastings and his aide have denied the allegation. The day before the Congressional hearings, Michael Battle, the Justice Department official who had made the telephone calls to dismiss six of the eight prosecutors, announced he was leaving his job. The Department described the sudden departure as long planned, having nothing to do with the controversial terminations he had been required to carry out. But Democrats immediately questioned that version of events. Said Linda Sanchez, a California Democrat: "The wheels are coming off the Bush Administration's increasingly hollow defense of its decision." Amid all the criticism, several DOJ officials offered a robust defense of the Administration in testimony before Congress. One official, repeating the assertion that most of the firings were motivated by poor performance, cited the case of U.S. attorney Carol Lam of California, who last year successfully prosecuted former G.O.P. Rep. Randy "Duke" Cunningham for corruption. The DOJ official said Lam was pushed out, not because of the Cunningham case, but because her prosecution rates for violent crime and border violations were inadequate. Another DOJ official testified that Iglesias had been fired because he delegated too much to a subordinate and did not show enough "leadership". The firings might never have happened if not for a little-noticed clause slipped into the Patriot Act last year. That provision, promoted by the White House, permits the President to appoint "interim" U.S. attorneys without Senate confirmation for an indefinite period. The White House successfully pushed the measure because it regarded the previous law (which allowed unconfirmed U.S. attorneys to serve for only 120 days) as an undue limit on the prerogatives of the President. Living within those limits, however, might have been easier for Bush to endure than the controversy the firings have now embroiled him in.